I kind of went off the beaten path the Logo of the Month on this one. It is such a cool logo, though, I just had to feature it. 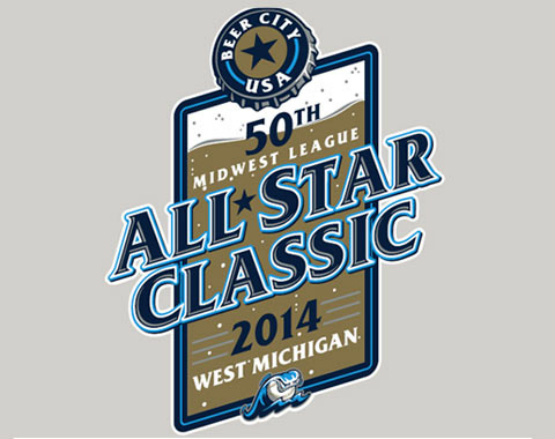 Tickets for the 50th Midwest League All-Star Classic that will take place just north of Grand Rapids, go on sale on March 4th, with the game itself scheduled for June 17th. This will be a great way to kick off our baseball trip for sure. Grand Rapids boasts the name ‘Beer City, USA’, after winning an online poll for two years in a row. Fifth Third Ballpark also host the annual Michigan Brewer’s Guilds Winter Beer Fest in February, with many local breweries at the event. This is the third time in history that the Whitecaps have hosted the All-Star Classic, the other years being 1995 and 2003. Last season, Whitecaps’ second baseman Devon Travis won the Most Valuable Player award. Deik Scram also won that award in 2007 for his all-star game performance. 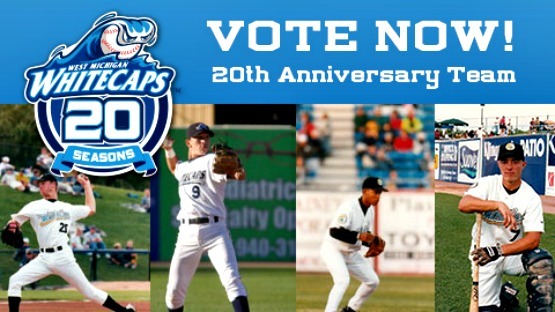 Four current Detroit Tigers’ players have represented the Whitecaps in the past, including Ramon Santiago (2000), Don Kelly (2002), Hernan Perez (2011). 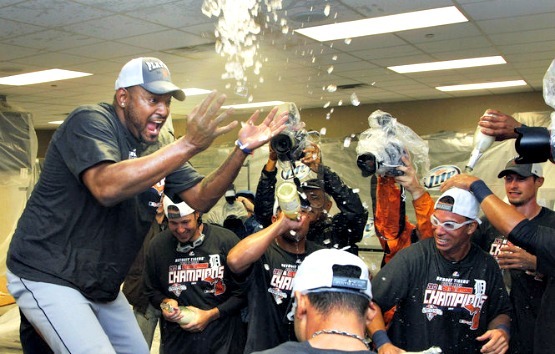 and Bruce Rondon (2011). 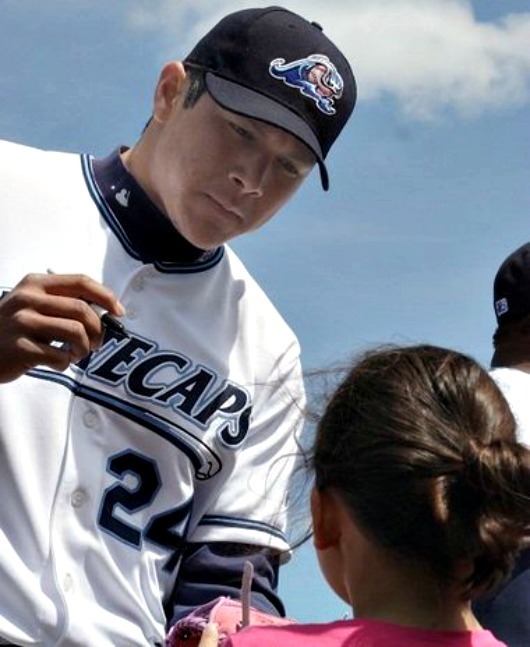 Miguel Cabrera participated during the 2001 season, representing the Kane County Cougars. Other notable MWL alumni to play in the all-star game are Mike Trout in 2010 (Cedar Rapids), Clayton Kershaw in 2007 (Great Lakes), Prince Fielder in 2003 (Beloit), and Wil Myers in 2010 (Burlington). 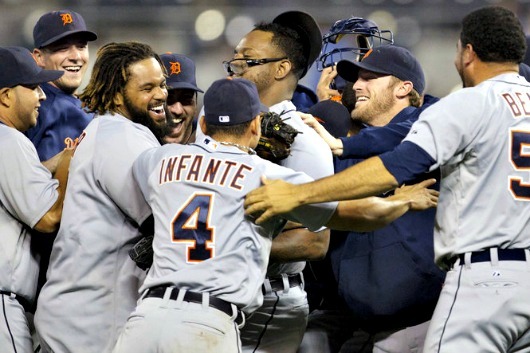 Last night the Detroit Tigers clinched the American League Central Division title by beating the Kansas City Royals 6-3. This is the Tigers second Central title in a row, and the 14th division title in their history. As the team picked by most experts and fans from the get-go, the Tigs didn’t make it easy on any of us, and floundered for most of the season around or under .500 before making a final push the last two months of the season. Miguel Cabrera had another big day, going 4-5 with a home run. He’s now batting .329 and is definitely one of the favorites for the MVP. Miggy’s 203 hits, 40 doubles, 44 homers, 137 RBI’s have been equaled only three times in history…twice by Lou Gehrig and once by Babe Ruth. That’s pretty good company, I’d say. 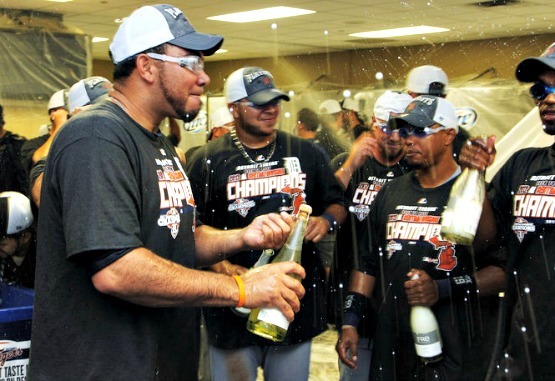 It would also be unMIBy of me not to mention the former Whitecaps that are on this championship team, like Alex Avila, Omar Infante, Don Kelly, Andy Dirks, Brennan Boesch, Ramon Santiago, Danny Worth, Avisail Garcia, Brayan Villarreal, Louis Marte, and Luke Putkonen. There. Now all is right with the world for the time being… Good luck to the Tigers in the playoffs! And Garcia make it 100! Congrats to outfielder Avisail Garcia, who became the 100th West Michigan Whitecaps alumni to play in Major League Baseball. He was called up to the Detroit Tigers Friday from the Double-A Erie Seawolves. He had a key RBI single in the Tigers 7-4 over the Chicago White Sox. He went 2-4 in last nights 4-2, and is now batting .429. Detroit would sweep the series, tying the ChiSox for first place in the AL Central Division. Garcia is the eight former Whitecap to be called up to a MLB team this season, with Tigers bringing up pitchers Casey Crosby, Luke Putkonen, Jose Ortega, and Thad Weber, as well as infielder Hernan Perez. Former Tigers 2007 Minor League Player of the year Gorkys Hernandez debuted with the Pittsburgh Pirates this season, and catcher Rob Brantly debuted with the Marlins after being traded to Miami this month. Speaking with MLive.com about the Whitecaps organization was Toby Harrah, former roving hitting instructor, and now assistant hitting coach with the Tigers. He had nothing but good things to say about the organization and quality of the ballpark, coaches, and front office. Thirteen ‘Caps alumni were even part of Detroit’s Central Division championship team last season, including Alex Avila, Brennan Boesch, Brandon Inge, Ramon Santiago, Andy Dirks, Ryan Raburn, Scott Sizemore, and Duane Below. The Tigers organization has also used some former West Michigan players for trade, gaining the likes of Miguel Cabrera for Cameron Maybin. Whitecaps vice president Jim Jarecki also spoke with MLive.com about the teams’ milestone. As for Garcia, he was signed by the Tigers back in 2007, and played in West Michigan in 2009-10 as a teenager. He hit .281 in 2010 with 17 doubles and four home runs. With Boesch struggling this season, the right field position could be open if Garcia can make the best of his playing time, and help the Tigers to the playoffs.